Independent senator Bernie Sanders (Vt.) pledged to end "disastrous" state right-to-work laws if elected president in 2020. Sanders, the first major-party presidential candidate to have a unionized campaign staff, made the promise on Monday while addressing the International Association of Machinists in Las Vegas, Nev.
"Brothers and sisters, if we are serious about creating an economy that works for all of us, not just the top one percent, not only do we need to defeat Donald Trump and rollback his anti-union policies, we need to expand the trade union movement in America," Sanders told the audience. The senator said, if elected, he would implement a wide-reaching agenda to rebuild organized labor. Sanders's policy prescriptions ranged from overturning rules certifying "airline and rail unions" to nominating "pro-worker appointees" to the National Labor Relations Board. One policy proposal, however, was specifically ambition. "When we are in the White House, we are going to pass the Workplace Democracy Act that I will be re-introducing in the Senate," Sanders said. "Under this legislation, when a majority of workers in a bargaining unit sign valid authorization cards to join a union, they will have a union. Period. End of discussion. And if employers refuse to negotiate in good faith, we will impose strong penalties on those companies." 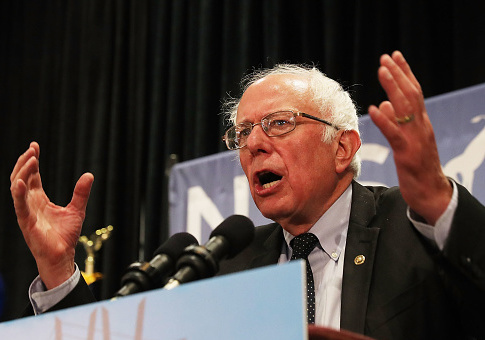 As previously reported by the Washington Free Beacon, Sanders's Workplace Democracy Act makes it easier for workers to unionize and force employers into contract negotiations. Among its provisions, the bill expands the definition of "employer" and "employee" to encompass independent contractors and repeals section 14(b) of the 1947 Taft-Hartley Act. The section allows states to prevent unions from mandating membership or payment of dues as a condition of employment. "Under this legislation, we will end, once and for all, the disastrous right-to-work laws," Sanders said. "This year we have seen a right-wing think tank try to follow the disastrous Janus decision with another court case that could essentially impose right-to-work on the airline industry." "In a Bernie Sanders administration, that will never, ever happen," he added. Sanders's pledge comes as union membership has fallen to an all-time low. In January, the Bureau of Labor Statistics reported that overall only 10.5 percent of all jobs in U.S. economy at the end of 2018 were unionized—down from 20.1 percent in 1983. The decline has coincided with the rise globalization and technological advancement. This entry was posted in Politics and tagged 2020 Election, Bernie Sanders, Unions. Bookmark the permalink.